Hi friend as per last Supreme Court order against AICTE that Supreme Court dissolve AICTE as an only advisory body for technical courses. All power of recognition, affiliation and renewal of course affiliation is on hand of UGC. So technical courses are not under shadow of AICTE now. Now with reference to this order where the recognition of AMIE stands? if we look on the order copy of MHRD where they withdraw the recognition from AMIE. MHRD mansion at point (iii) that after 31.05.2013, based on the review by the regulator I,e Aicte, a decision on continuation of the certification of equivalence of degree/ diploma shall be taken by statutory regulator. This order was given on 06/12/2012. As per the Supreme Court in its judgment of April 25, 2013, has ruled that colleges affiliated to a university do not come under the purview of the definition of technical institution as defined under Section 2 (h) of the AICTE Act, 1987. So after this order all come under hand of UGC. Now look on role of UGC on AMIE. 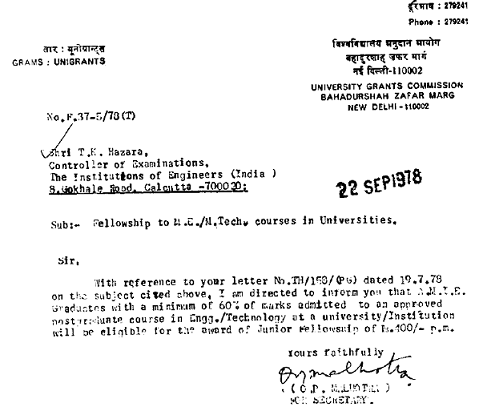 UGC already given equivalence of B-tech degree on order dated 22 September 1978. In the order the mansion after completion of Section A and Section B of AMIE students are eligible for getting admission in ME/M tech. The sanction later is attach bellow for your reference. Now you people decide where we stand for? Now can we say AMIE is approved Course equivalent to BE/B Tech? Is any reason to worry for our recognition? Please reply your opinion to share this topic in front of all who criticize AMIE as compared with B Tech. Lots of time i face this question in social media that is AMIE approved by AICTE ? are we get any value after completing AMIE ? is AMIE valid now ? I know everyone has doubt on their mind after notification published by AICTE. Here i upload this original notification. 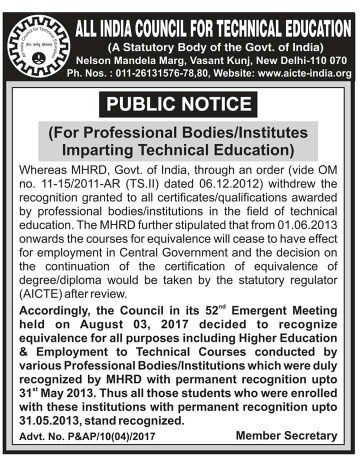 It means candidates enrolled before 31.05.2013 are AICTE approved now. Post 31.05.2013 it's still pending. It does not mean post 31.05.2013 candidate are not valid. Till now it is under Delhi high court. It is a notification published by AICTE not by Delhi high court. Who knows in future AICTE may remain functional or not? Because all ready discussion started that all general and as well as technical university come under UGC. Now i attach the mail reply the point of view of IEIndia. 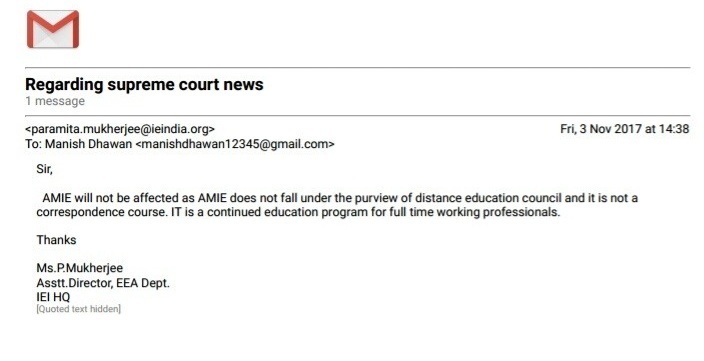 She clearly mention that AMIE is not a correspondence course it is a full time course for working professionals . So it will not come under AICTE. Rest of decision you have to take or wait for the final verdict of court. If you ask my opinion? Then i tell if you are a regular student and have opportunity to join regular course then join any regular btech course. But it is not truth for all. Because it is not possible for working professionals. So in my opinion It is far better than siting at home. keep visiting the post for latest update regarding AMIE approval. Please reply your comment. Because your comment may help others. Hi friends we know you people are waiting for the final verdict of Delhi high court. As we know that last hearing date was 08-March-2018. So lots of you Waiting for the outcome of Delhi high court result. I checked the delhi high court website (source link http://delhihighcourt.nic.in/dhc_case_status_list_new.asp?ayear=&pyear=2013&SNo=2&SRecNo=29928&dno=&dyear=&ctype=&cno=&cyear=&party=&adv=. I found status is pending. So we have to wait again some of day to get clear Idea. Keep visiting our website for further update. is AMIE approved by AICTE? amie is valid or not? to be happen. so dont worry guys, and lets hope for the best. The sanction letter you have attached herewith, is not clear. Can you scan it again? hi friends as we all know that the issue of AMIE recognition is in court and next hearing is on 31/07/2014. So its time to cross your fingers and pray from god in favour of us. Again it extended next date of court case is 19 dec 2014 after court gives last decision date. 19 December may vital decision will come. hope for best. subham wrote: Again it extended next date of court case is 19 dec 2014 after court gives last decision date. 19 December may vital decision will come. hope for best.